I recently had the opportunity to review the Chevy Impala for this blog, but I turned it down. I very rarely turn down vehicles for review, I’ll pretty much review anything. But the thing that stopped me from reviewing the Impala was knowing from the get-go that I wouldn’t be kind to it, and when that happens, it’s just not fair to the automaker. I knew that the current Impala is so tired, so uncompetitive, and so bland that reviewing it would be a bit like reviewing Halifax Mayor Peter Kelley’s performance during his tenure which could be summed up in a word: dreadful. Besides, as this latest spy shot indicates a redesign is clearly in the works even if it is long overdue. 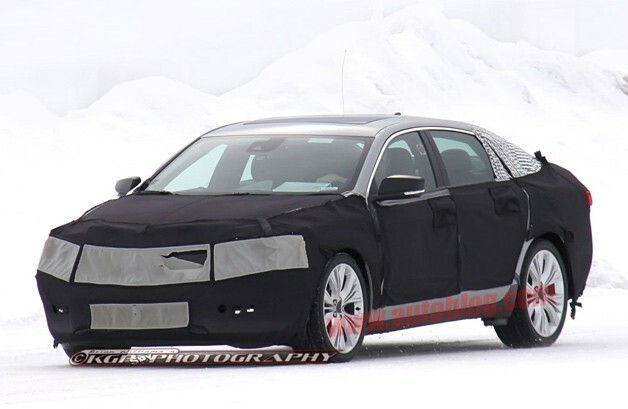 Despite that camo, the 2014 Impala obviously has more interesting lines and will largely have underpinnings from the upcoming Cadillac XTS. However unlike the XTS, the new Impala is expected to remain front-wheel drive making it more of a Ford Taurus and Toyota Avalon competitor than a Chrysler 300 competitor. Some of GM’s latest trends should find their way to the Impala too such as e-assist and the company’s new 2.0 litre turbo four. Let’s hope they decide to keep the SS badge alive too. But perhaps the best news on the new Impala is that it will be home grown in Oshawa where a host of other GM models are built such as the ATS, XTS, and Camaro. Expect the next generation Impala to bow sometime in 2013.